There’s a contest in this blog post. 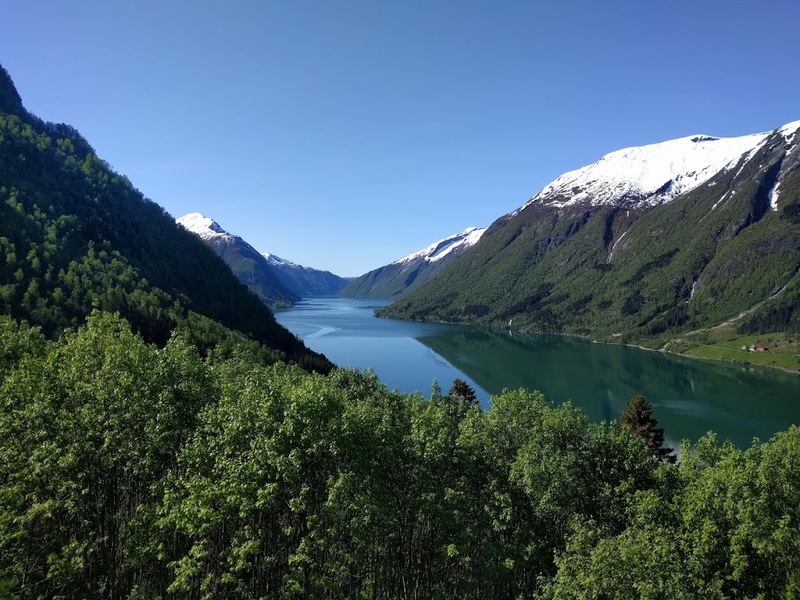 Keep reading to see what it is and how you can win.I drove around today, probably less than 300 kilometers, starting at 8:30 this morning and getting back to Balestrand at 19:00. I’ve taken some great road trips. Last year in the southwest, a good portion of my Balkan trip two years ago, my Oregon road trip three years ago, my day trip to Öland four years ago, my Maine and Maritimes trip back about ten or twelve years ago, and plenty more. I’ve seen some incredibly beautiful scenery out the car window. I’m not sure any of them compare to what I saw today. 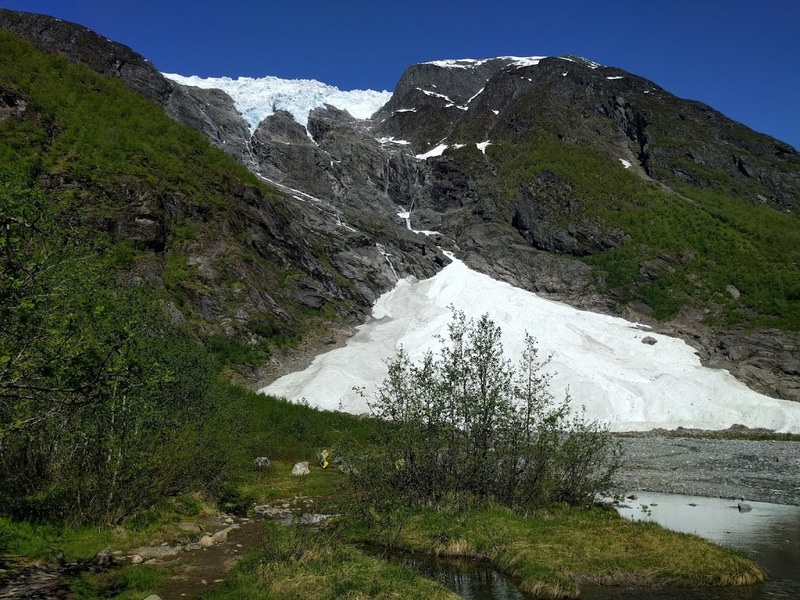 Another detour to the Supphellebreen glacier (which is redundant, because “breen” means “glacier”). Continue on Route 5 to Skei (pronounced like “shy”). There were so many beautiful things to see along the way. I stopped frequently just to gape (and snap photos). I’m just sharing a few highlights for now; I’ll post more when I get home. Road sign showing the entrance to the town of Mundal. 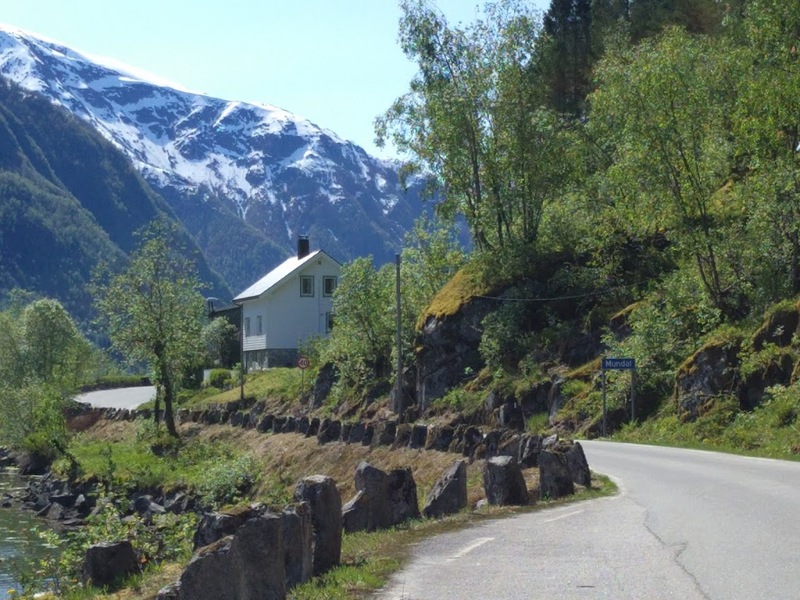 This town is known as Norway’s book town. All over the town are book sellers, in some cases just little huts or bookshelves along the side of the road with a box to leave your money. But Mundal’s other claim to fame is that it is the ancestral home of a famous American (who, one of the bookstore people told me, has visited the town twice). The first person who leaves a comment on the blog with the correct name of the famous American who has roots in Mundal wins a special prize: a souvenir from this trip. (If you don’t live in Seattle, you have to come pick it up; I don’t deliver.) And no cheating. No looking it up on the Internet (which, I was happy to read today in the New York Times, will no longer be capitalized starting on June 1st). Use your powers of deduction. Supphellebreen. I was lucky enough to spend a half hour at the foot of the glacier all by myself eating the picnic lunch I’d packed. This was a sublimely beautiful spot. I kept thinking how it would be overrun with tourists if it were in the USA (and it would be in a National Park where you’d have to pay to see it). But after I finished my lunch and still didn’t want to tear myself away, a bus load of school kids arrived, so I departed. Here I am at a waterfall with a footbridge over the top. You can’t see the waterfall very well in this picture, mostly just me and the footbridge (and the only other people who were there). The waterfall is called Likholefossen. (“Fossen” means “waterfall.” I’m not sure what “Likhole” means. Feel free to make something up. I saw dozens, maybe even hundreds, of waterfalls today, from big close‐ups to narrow cascades down the side of a distant mountain. Along this one stretch of Route 13 that parallels the Gaula River, there is a hiking trail that follows the river and leads from waterfall to waterfall. 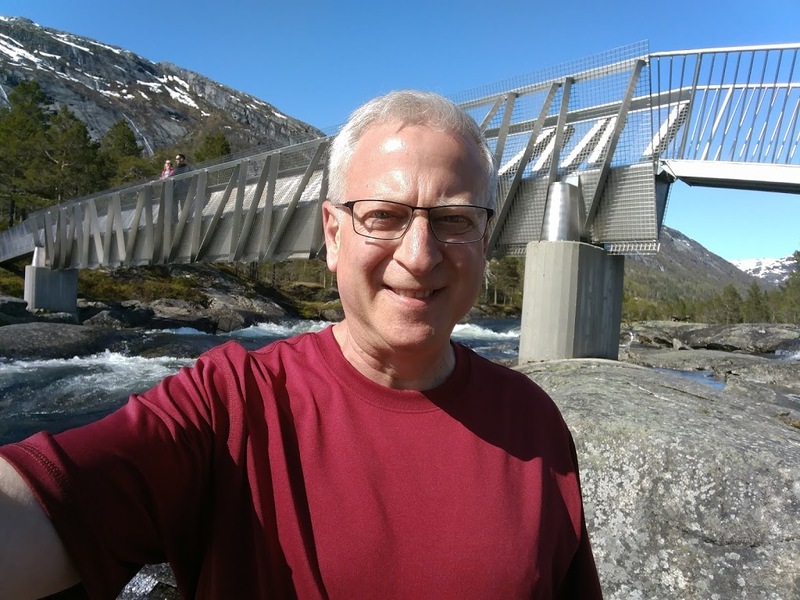 I hiked from Likholefossen to Hovsfossen, about 4 kilometers round trip. This area of the Gaula River is called Fosselandet, the land of the waterfalls. Toward the end of my journey the highway (I use the term loosely; in places it was barely wide enough for two approaching cars to pass each other; fortunately, there weren’t a lot of other cars, but I did have a run in on a small side road with a big farm tractor, and another with a tour bus going through one of the many tunnels) the road rose up above tree line, past lakes that are still partly frozen and snow banks a meter or more deep. This section of the road is closed in the winter and probably only opened a few weeks ago. From the top the road plummets dramatically into the valley with a series of hairpin turns. They are building a new viewing platform at the top. Unfortunately it was fenced off and I couldn’t go on it, but it jetted out precariously over the edge of the mountain. I guess I’ll have to come back later this summer when it opens. I was ready for a big dinner when I got back to Balestrand, so I decided to splurge on the world‐famous buffet at the Kviknes Hotel. They had some excellent food. One table was devoted to salads. There were two tables of cold seafood, including lots of salmon, crab claws, peel‐and‐eat shrimp, and more. There was a cheese table. There were two main dish tables, one fish‐based and one meat‐based. Each had three options for main dishes and two sides. There was a bread table. And then there were the desserts. About ten different kinds of mousse, ice cream, bread pudding, creme brulee, brownies, cookies, cake, flan, and parfaits. It was mostly all very good, served in a large and crowded dining room, but the lines at the buffet were never long. Of course, like everything else in Norway, none of this came cheap. And now here I am once again enjoying the view of the Sognefjord from my hotel room balcony, for one last night. Tomorrow I catch the ferry to Bergen at 7:50. No I didn’t look it up, he’s 4 years ahead of me at Macalester. And the puzzle is the hint. I knew you’d get this, Mary!